The Finland Connection is being made available for the enjoyment of the Northland's Finnish Community. Use the Finnish Connection for links to Finnish Newspapers. These links will not only provide you with up-to-the minute news from Finland, but also provide you or your children a great opportunity to brush up on your use of the Finnish language. Turun Sanomat A full feature Turku newspaper available in Finnish only. Tuesday evening three Finnish Elves and a small group of American-Finlanders gathered at the Finnish American Heritage Center in Hancock. The gathering sang holiday songs and carols while the Three Semi-Finnish Elves provided the musical accompaniment. The Elves names will now be made public, they were Pasi Lautala, Oren Tikkanen, and Randy (Raimo) Wakeham. 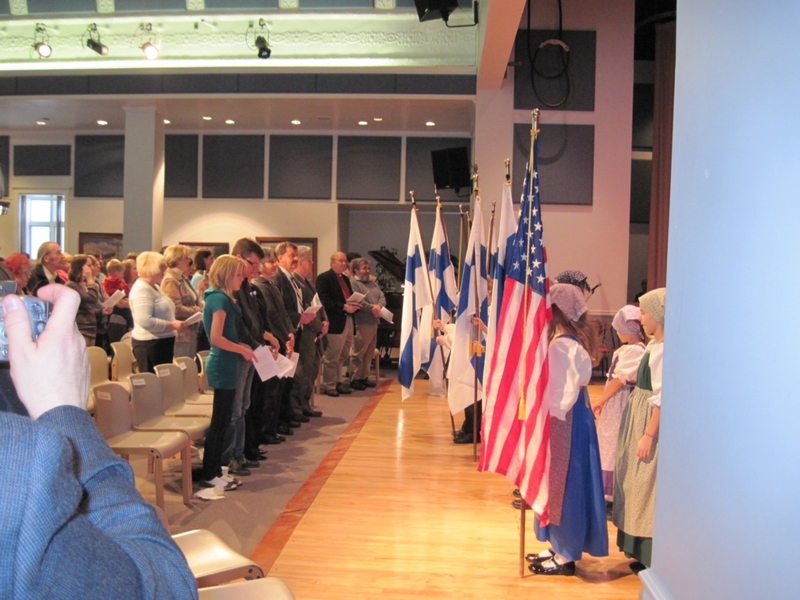 On Sunday, December 6, at 2:00 p.m., the Finlandia University Finnish American Heritage Center hosted its 92nd annual Finnish Independence Day program. The program celebrates the anniversary of the date Finland gained its independence in 1917. 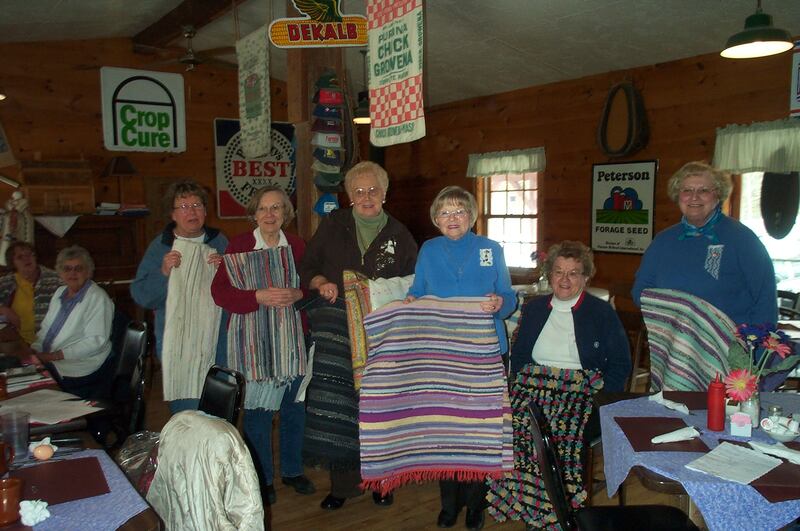 The monthly meeting of the Ladies of Keleva, Ainon Tupa #13 was held in Baraga on Novmber 10th. 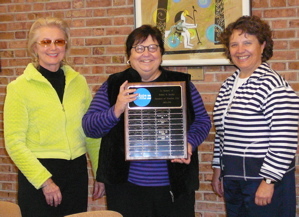 A report from the Ladies of Kaleva's Midwest District meeting held in Duluth on September 26 was given by Linda Graham. Next year's meeting will be hosted by the Thunder Bay, Ontario Tupa. the group discussed possible location for the event. Kris Miilu gave an update on the possibility of getting the Mason Building. 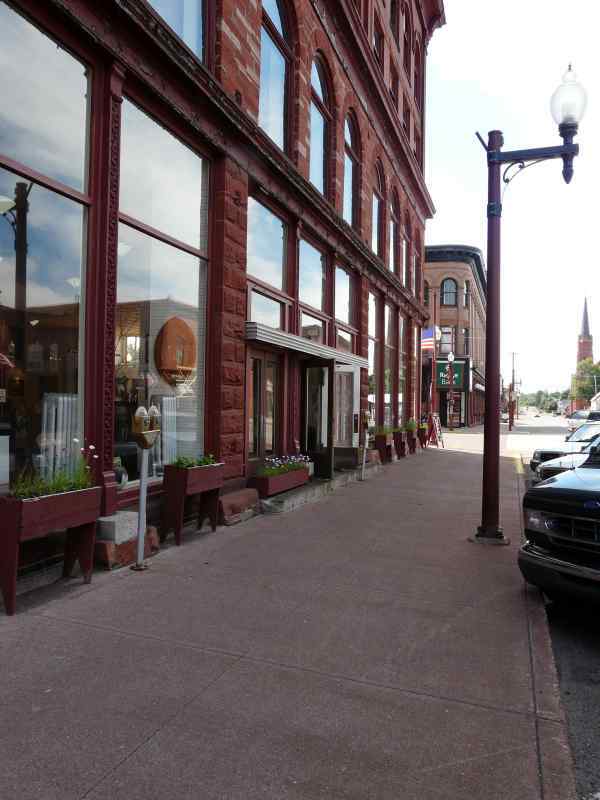 The group has been investigating the possibility of purchasing the Old Mass City Mason Building. After considering all the pros and cons it was determined that the building is too old and requires too much repair. 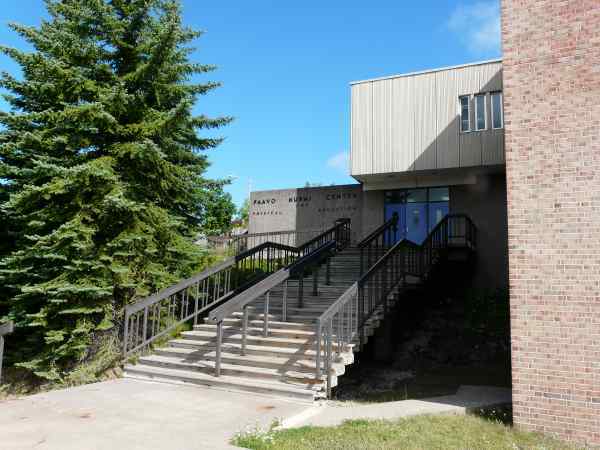 The cost of the building and the repairs would be more than the group can afford. ED. Note: The Ladies of Kaliva provide among other things, college scholarships to the area's Finnish Youth. KIMBALL - Little Finland in Kimball, was the scene of Sunday’s celebration of St. Urho’s Day. 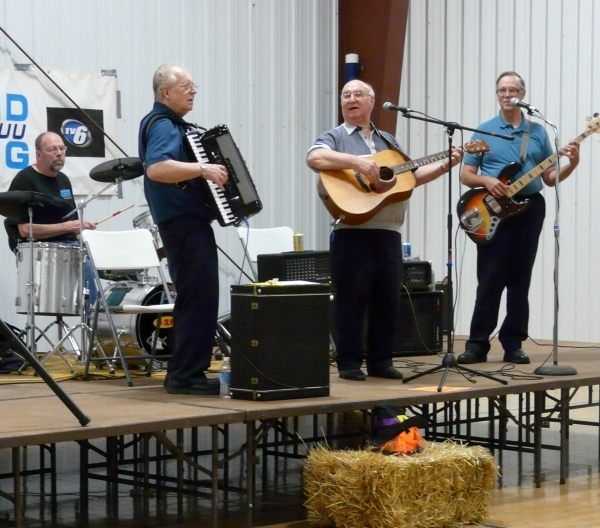 Gogebic and Iron County Finlanders spent the afternoon listening and dancing to the great music of Dorothy and the Boys. 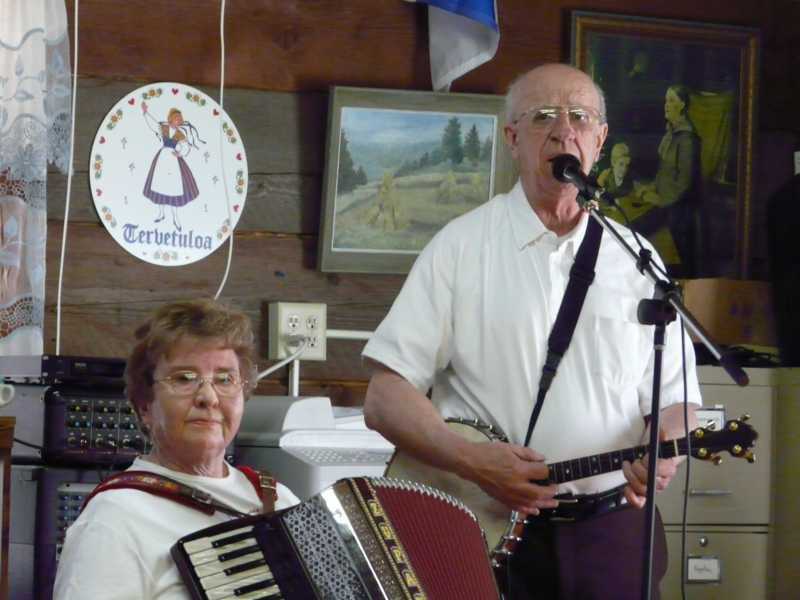 The musical group plays and variety of music for their audience which includes polkas, country and western and vintage popular songs. I just want to make sure that I have informed everyone that our troupe of "Kalevala: Land of Heroes" will be making a trip down to "Finn Camp" (http://www.finncamp.org/) in Wixom, Michigan for two shows on August 22nd. Matinee at 11am and evening at 7pm. Tickets purchased in advance are $12/adult and $8/child to 17 years old. Tickets purchased at the door are $15/adult and $10/child to 17 years old. These performances are sponsored by: Knights and Ladies of the Kalevala, Detroit Finnish Cooperative Summer Camp Assocation (Finn Camp), and the Finnish Center Association. (I'm pretty sure that you have to be logged in to Facebook to get that link to display properly) If you're on Facebook, I'd love it if you RSVP'd... even if you RSVP that you aren't able to attend. PLEASE help us publicize this event by sharing it with as you deem appropriate. All of us involved are really pleased at the response to this show. I don't think that there are any plans in the works for the show are after August 21st, but we're open to suggestions. Thank you for all your support and thank you for talking this show up to your friends. It has been really helpful. Johannus a high point on the Finnish calendar comes exactly six months after Christmas, when the interminable nights of winter have given way to the white nights of the Finnish summer. In the north of Finland, Midsummer marks the peak of the exotic appeal of the Arctic, as the sun remains above the horizon all night. 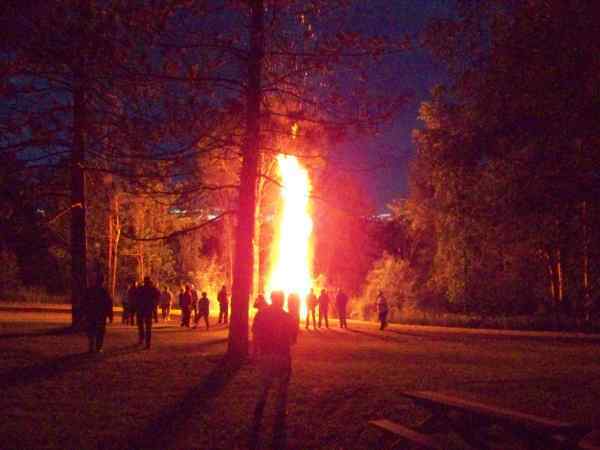 Lighting a bonfire is the high point of Midsummer night. 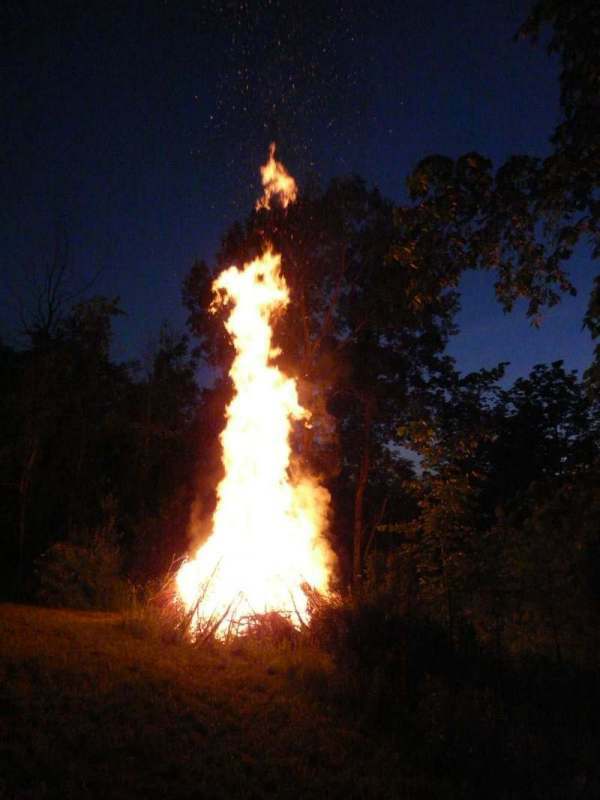 Originally, bonfires were only part of the eastern Finnish Midsummer In the Finnish midsummer celebration tradition, bonfires (kokko) are burnt at lakesides. celebrations. 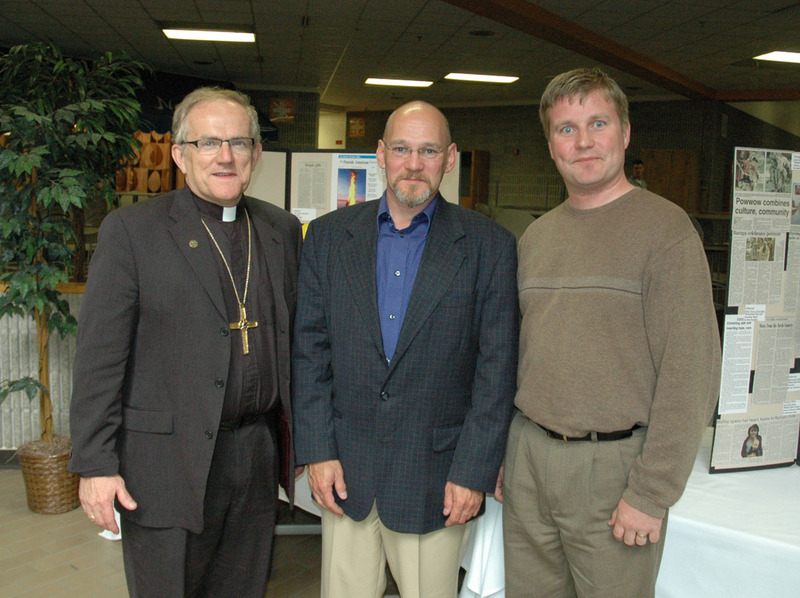 (L to R) ELCA NGLS Bishop Thomas Skrenes, FAR editor James Kurtti, and FAR Asst. Editor David Maki at the Good News Award luncheon and awards ceremony June 10 in Marquette, Mich.
was awarded three 2009 Good News Awards. Reporter (FAR) received the following Good News Awards. 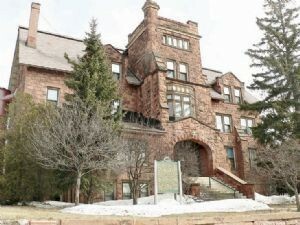 Diocese of Marquette at 906- 227-9129. "Transforming the Cutover" is on display at the Finlandia University Gallery through February 13. The Ladies of Kaleva, Ainon Tupa #13 of Mass City, Michigan met for their Pikku Joulu (Little Christmas) celebration on December 9, 2008 at the Parkview Lodge and Grill in Twin Lakes. 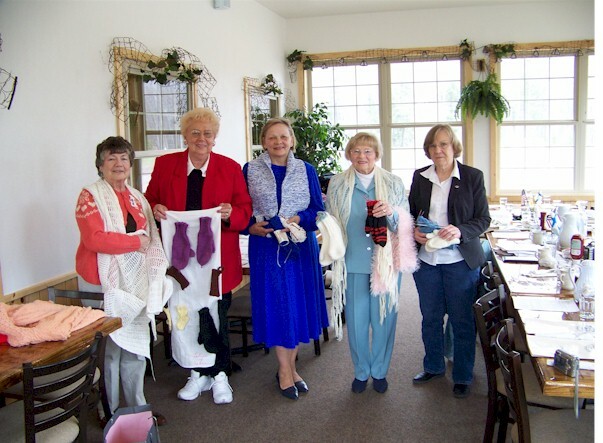 Each lady brought a gift to exchange and a candle for their placemat. This was the final meeting for the group for 2008. The next meeting will be in the spring of 2009. The only business the group conducted was to approve a donation be sent to the Kivajat dance group which is lead by Kay Seppala. 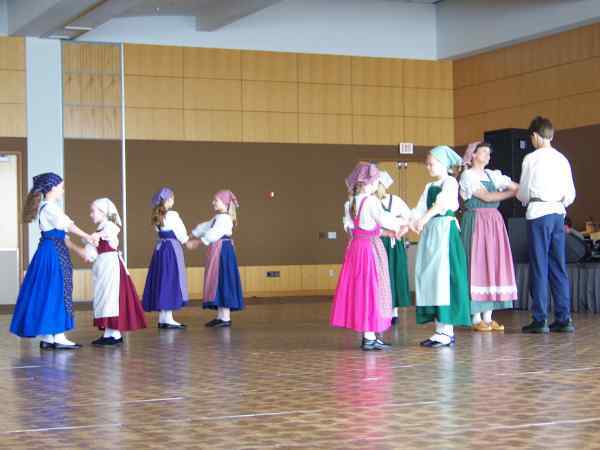 This children's dance group has an opportunity to go to Finland next summer and needs around $20,000.00. Ainon Tupa #13 ladies enjoyed a delicious lunch, then exchanged gifts, and sang some Christmas songs. Best wishes to everyone in 2009. Onnea kaikkille! 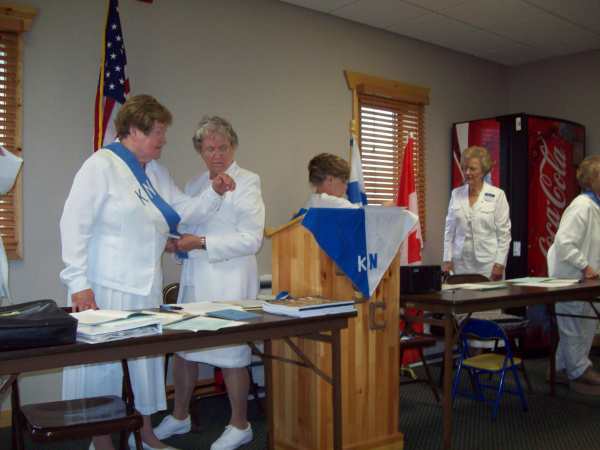 On Saturday, September 27, 2008, the Midwest District of the Ladies of Kaleva met in Esko, Minnesota at the Thompson Township Building. The Vainottaren Tupa hosted this event and six Tupas were represented at the meeting. Vivian Williams took over as Matron and presided over the meeting. A report was presented from each Tupa to update everyone on the past year's activities. A "Suomen Koulu" has been started that will last for six weeks and meets every other week in Virginia, MN. In Cloquet, the Kaleva Ladies bring baked goods to the nursing home and this activity is well-received by the residents. Finland Calling came calling at Covington this past Sunday when Carl Pellonpaa hosted a Suomi Kutsuu Dance sponsored by the Covington, parks and recreation department. 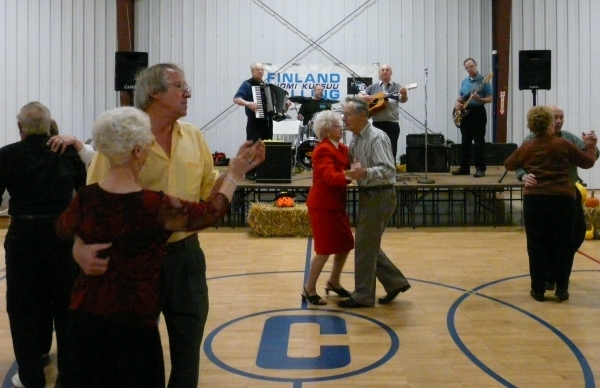 Finlanders and their friends came to dance all afternoon to the music of the Polka Drifters a really great band! The Polka Drifters played a wide variety of music including Country, swing waltzes and of course Polkas! Ron Masters does a great job as the band's singer. 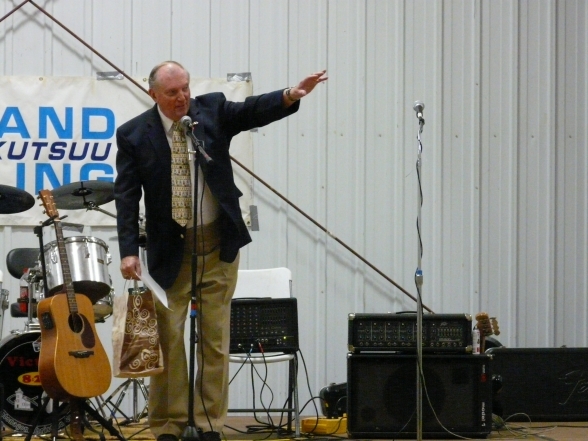 Often band singers just get the job done, but Ron does a great job as does the rest of band. 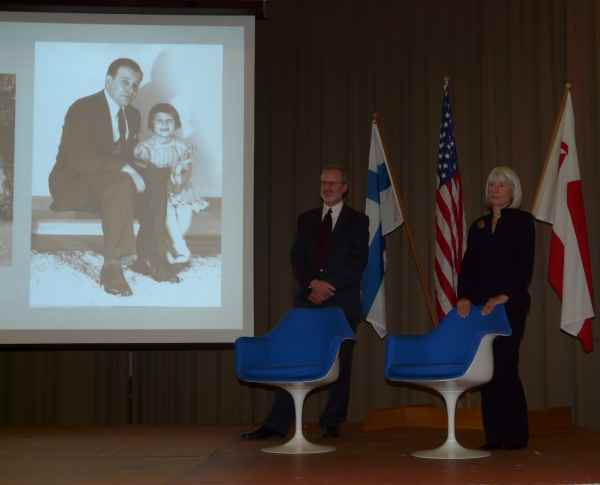 HANCOCK – The architectural and design achievements of the Finnish Saarinen family were the subject of a presentation this past week, at the Finlandia University Finnish American Heritage Center. “The Artistry of the Saarinens,” was presented by Mark Coir, director of archives at the Cranbrook Educational Community, Bloomington Hills, Mich.
After Mr.Coir's presentation Susan Saarinen, the granddaughter of architect Eliel Saarinen and the daughter of architect Eero Saarinen, provided the audience with personal insight into the lives of her extremely talented and artistic family. 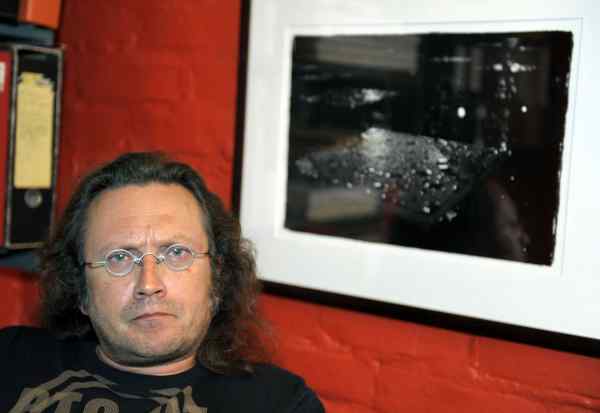 HANCOCK, MI – Finnish artist and photographer Jari Arffman will visit the Copper Country and work with Finlandia University students from September 6 to September 11, 2008. An exhibit of Arffman’s work is featured at the Finlandia University Gallery, in the Finnish American Heritage Center, Hancock, through September 11. A closing reception for the artist will take place at the Finlandia University Gallery Tuesday, September 9, 7:00 p.m. to 8:30 p.m. The reception is free and open to the public. Refreshments will be served. Since 1999, Finlandia University and the Sibelius Music Academy have collaborated to bring a taste of Finland's musical excellence to Michigan's Upper Peninsula and the Midwest. This annual international event promotes the enjoyment and appreciation of contemporary and traditional Finnish classical music, and strengthens Finnish­American ties with modern Finland. More than 50 Sibelius students have performed as part of this festival. Music and performing arts education, from pre-school to post-graduate, is an integral part of Finland's exceptional public education system. For the most accomplished student-musicians in Finland (and for musicians around the world) the Sibelius Academy is the destination for the best. and brightest. The prestigious Sibelius Academy, founded in 1882 and named for Finnish composer Jean Sibelius, is one of the largest and best regarded music academies in Europe. The Academy has trained renowned musicians such as Osmo Vanska, music director for the Minnesota Orchestra; Jukka-Pekka Saraste, previous conductor of the Toronto Symphony orchestra; and Esa-Pekka Salonen, conductor of the Los Angeles Philharmonic. 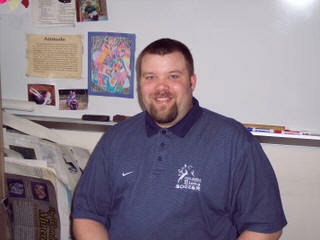 Head Softball Coach Shawn Hendrickson. The Finlandia University women's softball program is pleased to announce the addition of three outstanding athletes to this year's program. The new players who have committed to play for the Lions in the 2008-09 academic year are Nikole Metter (Rapid River, Mich.), Andrea Graves (Munising, Mich.), and Tena Vajcner (Ida, Mich.). HANCOCK, MI - The Finlandia University men's soccer team has received a commitment from Eric Johnson of Meade County, Kentucky, to attend and play for the Lions starting this fall, Head Men's Soccer Coach Matt Griffith announced today. Johnson, 6'2", graduated from Meade County High School in 2008 where for four years he was a goaltender for the soccer team. Johnson was named All-County Defensive Player of the Year in 2007 and 2008, and All-County Goalkeeper of the Year in 2008. "Eric will be a great addition to Finlandia's soccer program," said Coach Griffith. "He's a solid keeper with a knack for charging out of the net to deal with one-on-one situations. I expect Eric to make an immediate impact." For additional information about the Finlandia University men's soccer program, please contact Coach Griffith at 906-487-7326 or matt.griffith@finlandia.edu. 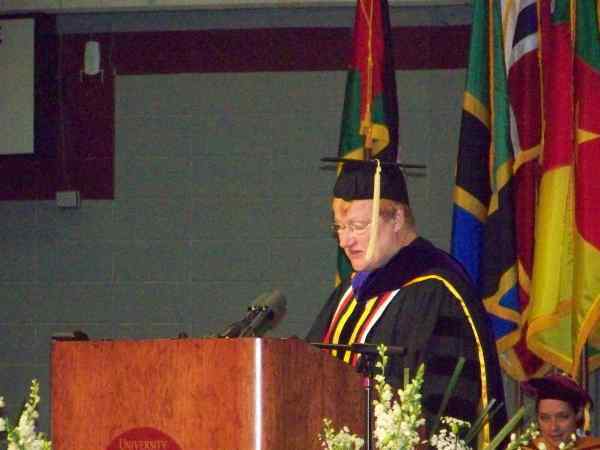 photo above Preident Halonen of Finland addresses audience when she was awarded an honorary Doctor of Laws degree for public service at the University of Minnesota Duluth. "Her outstanding leadership on behalf of the rights of women, and workers, and the poor have made her an international role model", Chancellor Kathryn A. Martin noted. IronwoodInfo reporter Linda Graham attended the 25th annual Finnfest Festival that was held in Duluth. Her in-depth knowledge of Finnish Culture continues to grow with each additional visit that she makes to Finnish cultural events. Linda is the editor of our "Finland Connect" page featured in the Community Section. Linda also produces her own Finnish Radio Show "Laulun Voima"
Linda, now a resident of Ontonagon, is an Ironwood native who grew up in Ironwood Township. Her maiden name was Linda Toolanen and she is the sister of IronwoodInfo reporter/photographer Arvo Toolanen. Six Boy Scouts from the Ironwood-Hurley Troop 323 came to Little Finland to build a bridge. NFAF is making a nature trail on the back eight acres of its 11 acres. Therein is a Class II Trout Stream, according to Daniel Houston of the DNR. Under the direction of Ryan Koski, who is working for his Eagle Badge (which is the highest rank in the Boy Scouts) five other scouts labored for just under six hours. Lending a hand and assisting the boys on site were Ryan's dad, Larry Koski, Russell Maynard, John and Cheryl Jacisin, and Paul Lemmons. Bill Perkins is the Scout Master of this troop. Little Finland provided a picnic lunch (served by Rosann) of hot dogs, hamburgers, baked beans, chips and pop for all who were there in some capacity, which included some of our own members as support for the troop. On Saturday, June 21 (the official first day of summer), Little Finland celebrated Juhannus with music, food, and a kokkotuli (bonfire). 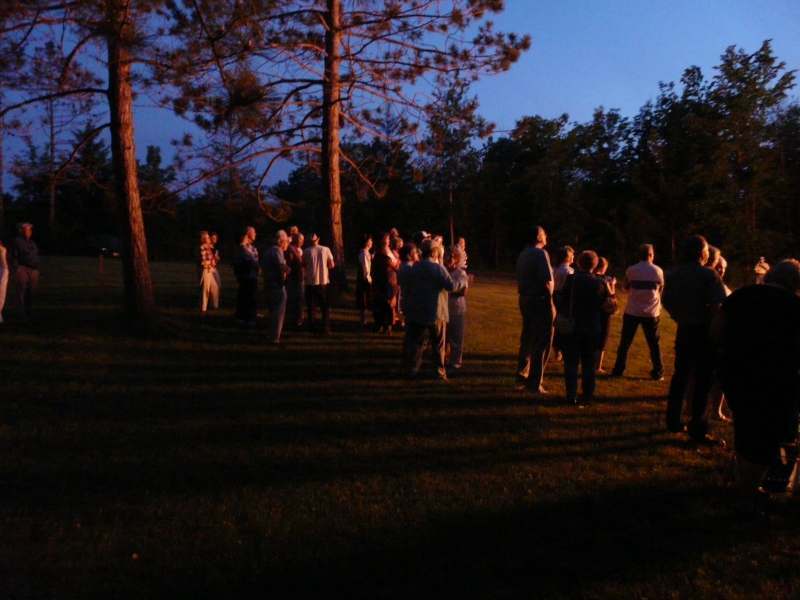 The festivities began at 7:00pm at the log building at Little Finland, located on US 2 just west of Ironwood, Michigan. Music in the building was provided by the Northwind Boys and everyone enjoyed listening and dancing. 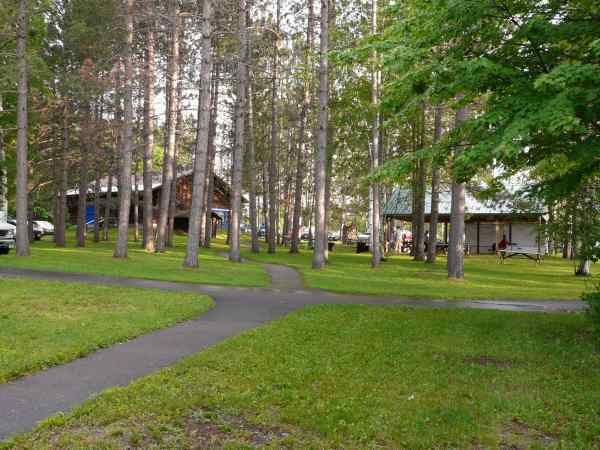 The outside pavillion was the spot for food and refreshments along with musicians taking turns on accordian and fiddle. 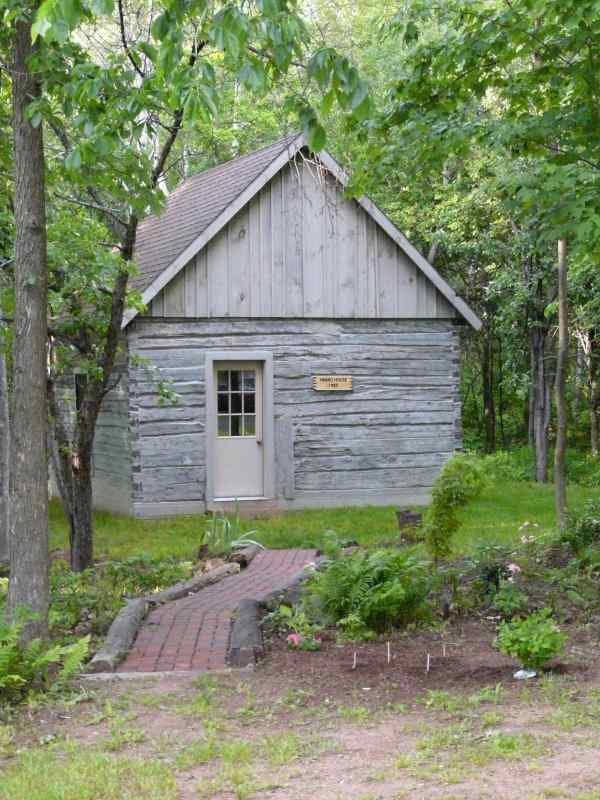 The Harma House, the Sauna, and the Haaro Building were open for visitors to stroll through. The kokkotuli was lit at dusk. weather was great, food was good, and the entertainment was excellent. The next event at Little Finland will be a dance on July 13 from 2:00pm to 5:00pm (central time) with music by Finnpower. 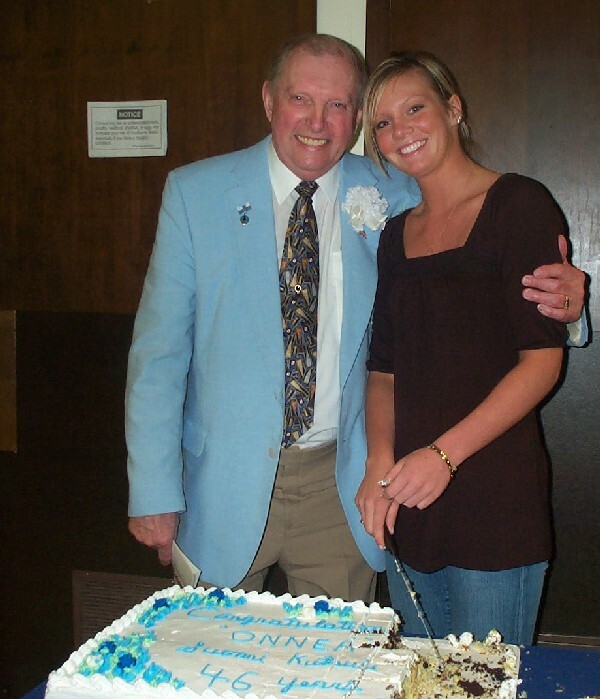 Carl with Granddaughter Kristen Pellonpaa serving cake. Marianne Wargelin (in the middle). FinnFest USA celebrates its 25th such festival this year as FinnFest 2008 takes place in Duluth, MN, July 23-27, 2008. Under the theme “Sharing the Spirit of Finland”, the event will honor Finnish culture and heritage and is expected to attract 7,000-10,000 people to its variety of dance performances, concerts, lectures, art exhibitions and tours.